Mom used to call me cabbagehead. 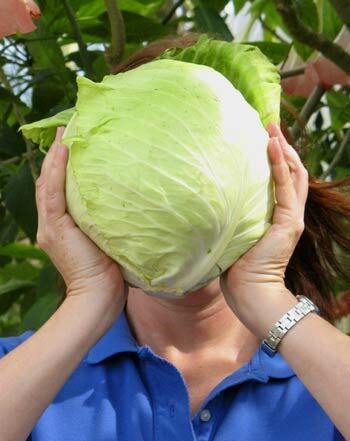 Last week I fished through the extras box and grabbed a giant cabbage as big as my head. Forgot to weigh it, but my guess is that cabbage was at least twice the weight of the average cabbage in the shares. There certainly was enough to make a large pot of Lithuanian Cabbage Soup. Mmmmmm almost as good as Mom’s. In a large pot, place the sauerkraut, chicken stock, smoked meat, peppercorns and bay leaves. Add water to cover. Bring to a boil, reduce temperature and simmer for 1-2 hours. Meat should be tender. Remove meat, discard bones, dice and return to pot. Add the shredded cabbage, tomatoes and onion. Bring to a boil, reduce to a simmer, and cook another hour or so. Add water as necessary to keep it soupy. Adjust seasonings to taste. Serve with hot boiled potatoes on the side. Note: You can substitute smoked turkey for ham hock. If you use chopped piper betel leaves in a vegetarian version, reduce cooking time to 45-60 minutes. With my Polish background, I do love a good hearty cabbage soup! I made a casserole with pork chops, tomatoes and potatoes with dill and caraway! Can’t get any more Eastern European than cabbage soup or casserole! PS: I credited you on my blog for the photo with a link, sorry I forgot! I appreciate you letting me use them. Mmmm that casserole sounds delish! Nothing like sturdy East Europen food to keep you warm through a cold spell. That giant cabbage made the aforementioned soup and a batch of kim chee, and there was enough left over to toss into a pot of veggie curry.